This color lithograph published by E. B. & E. C. Kellogg of Hartford, Connecticut, and George Whiting of New York City dates from 1861 or 1862. It is believed to be the first time that the elephant and donkey appear together depicting the Republican and Democratic parties. The phrase “to see the elephant” was a common expression in the mid-nineteenth century and often appears in descriptions of both the gold rush and the Civil War. It is thought to originate with the circus. The large mammals such as lions and elephants were the climax of the circus experience and always appeared toward the end of the performances. When one had seen the elephant then one had seen the entire show. The term then gradually became synonymous with experiencing or seeing it all. In this image the elephant bedecked in formal attire with accessories festooned with stars and stripes and the U.S. Constitution in his pocket represents the Union. The cannon barrels protruding from his waistcoat, and the multitude of even more cannon and cannon balls behind him, represent the great military prowess of the Northern states. Eventually Abraham Lincoln (1809-65) took on the elephant as his mascot. By his reelection campaign in 1864, trunks and tusks were used in his campaign materials and “the elephant is coming” became his slogan. Republicans have been associated with elephants ever since. 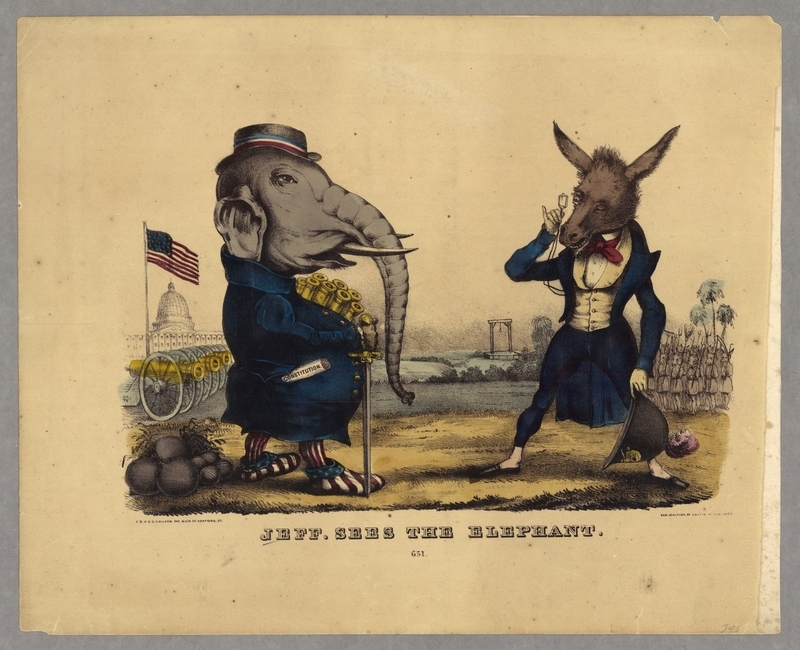 This humorous image also contains Jefferson Davis (1808-89) as a donkey, peering through a monocle at the elephant and his enormous quantity of arms and armaments. Behind him is an army of “jackasses” carrying pitchforks, rakes, brooms, and scythes, which are clearly no match for the North’s cannon. The gallows in the center background of the image portends a bleak future for the Confederacy. The donkey first became associated with the Democratic Party in the election of 1828, when Andrew Jackson (1767-1845) was depicted to be as stubborn as a jackass. Jackson, however, liked the association and turned the joke around, appropriating the donkey as his mascot and winning the White House over John Quincy Adams (1767-1848) in that contest. Jefferson Davis was a lifelong Democrat, having served as a U.S. representative and senator before becoming president of the Confederacy after the South seceded. The use of the donkey may also refer to the Copperhead Democrats in the North who were more sympathetic to the Southern cause and would eventually even advocate suing for peace during the conflict. Hartford, Conn.; New York, N.Y. Image and text 24 x 33 cm., on sheet 33 x 41 cm. “Jeff. Sees the Elephant,” The News Media and the Making of America, 1730-1865, accessed April 21, 2019, https://americanantiquarian.org/earlyamericannewsmedia/items/show/120.